For this block you will only need to make one nine-patch unit, so we won't be using strips. You will need five 1 1/2 inch squares, four 3 1/2 inch squares, and two 3 7/8 inch squares cut in half for half square triangles using a colored fabric. Then cut four 1 1/2 inch squares, and two 3 7/8 inch squares (cut in half diagonally also) of your background fabric. To make the nine patch block, lay out a nine patch block using your 1 1/2 inch squares. Sew into a nine patch unit, which will finish at 3 1/2 inches. I like to sew them just like I sew a full size quilt block. 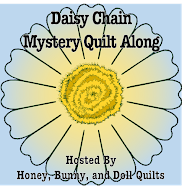 Sew the first two columns together, keeping them in a chain, then add the third column. And sew together into a finished block! Cute as a button, right? I'm loving all the color in this quilt! I'm starting to think about what I will need for sashing these blocks. I haven't really decided yet, but I have my eye on a couple of fabrics that I think will work. 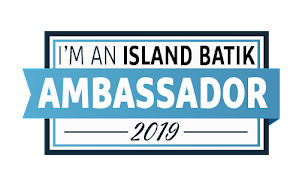 I'm using the Dotalicious line that I received from Island Batik for being an Ambassador. The block designs are my own, based off of traditional quilt blocks. Thanks for following along!